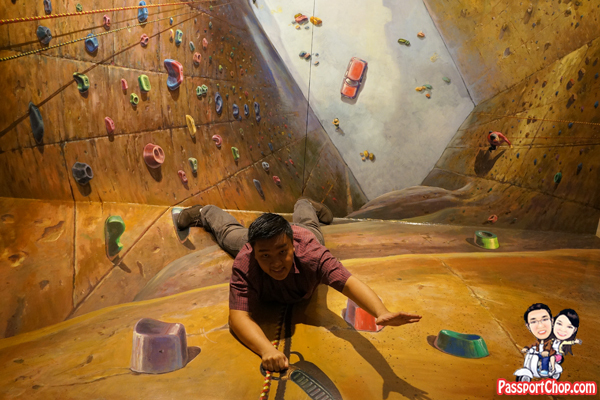 Before i go into my review of the Jeju Alive Museum, I thought i address one of the most common questions for travellers to Jeju interested in experiencing the fun of these optical illusions i.e. Yes. 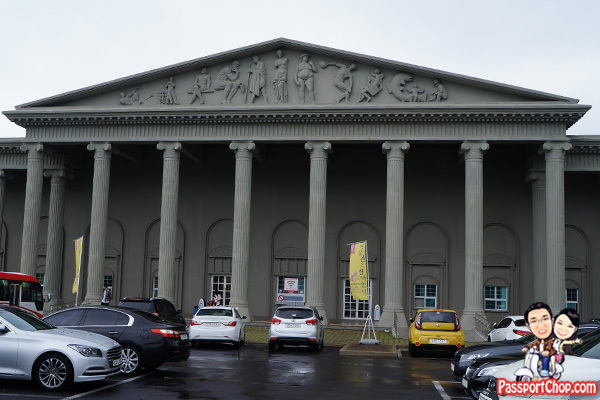 There are TWO museums in Jeju with the trick eye/trick art/optical illusions theme – The Jeju Trick Art Musum at Seong-eup (in the east side of Jeju) at Seogwipo and The Jeju Alive Museum at Jungmun Resort (mid-western-southern side of Jeju) at Seogwipo. Both are at Seogwipo but Seogwipo is a very big area covering almost the entire southern part of Jeju so don’t get confused. 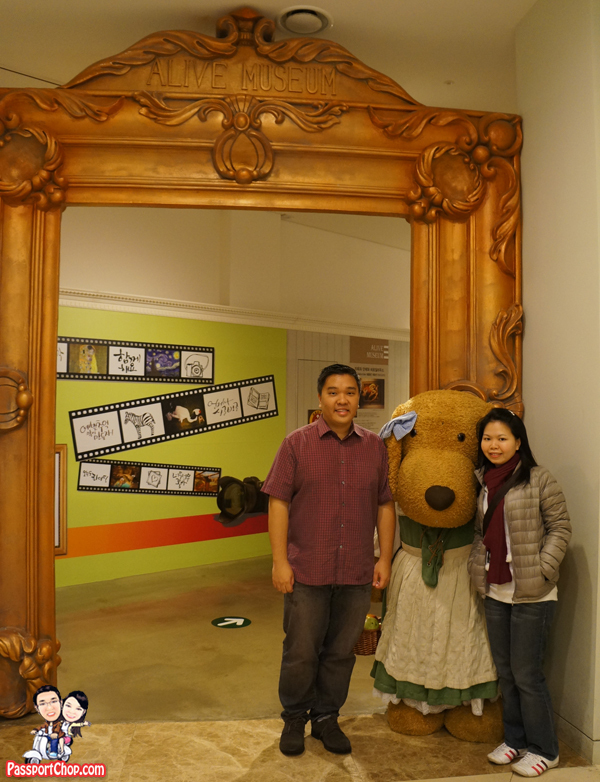 I have not been to both Jeju Trick Art Museum and Jeju Alive Museum but based on various travellers/bloggers who had been to both museums and shared their experiences about both museums, most preferred Jeju Alive Museum as according to them “it is bigger and more contents to enjoy”. Just some “fun facts” to help you make a better decision on which museum to go if you are still unsure. Jeju Seongeup Trick Art Museum is the first of the two trick art themed museums to be opened in Jeju (in 2009) and both Jeju Seong-eup Trick Art Museum and Jeju Jungmun Resort Alive Museum (opened in 2012) seemed to be from the same parent company (at least it appears to be as they are linked from their parent company website). The adult entrance fee of Jeju Seong-eup Trick Art Museum (8,000 KRW) is cheaper by 1,000 Korean Won (or about 1 USD) compared to that of Jeju Jungmun Resort Alive Museum (9,000 KRW). The opening hours of Jeju Jungmun Resort Alive Museum (9am to 11pm) is longer than that of Jeju Seong-eup Trick Art Museum (9am to 7pm). Jeju Seong-eup Trick Art Museum is located at Seong-eup (duh!) where you can find the Seong-eup Folk Village (do note that there are 2 other versions of Folk Village on Jeju Island) and you can visit it along the way to Seongsan Ilchulbong or Udo Island. So in conclusion, I guess *emphasise guess only hor* that the quality of the exhibits at both museums could be similar – just a matter of quantity so if you don’t have the luxury of a 4D3N Jeju itinerary, you might want to check out the Trick Art Museum on your way to Sunrise Peak from Seogwipo city. 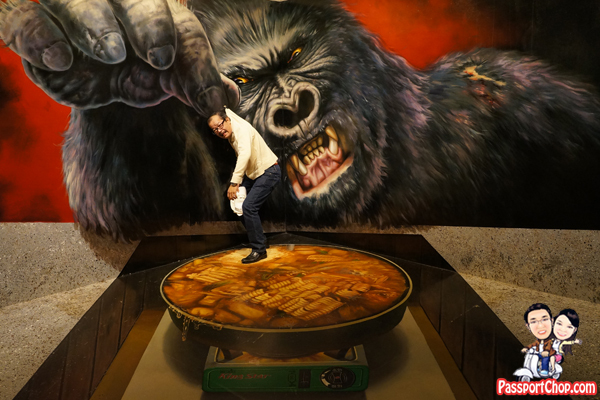 You can also check out the Trick Art Museum in Seoul Hongdae or even back in Singapore with the Trick Art Museum in Suntec City and Alive Museum in Resorts World Sentosa. There are 5 types of optical illusion art forms in Jeju Alive Museum — trick art, digital art, object art, sculpture, and Provence art. You can also find a large French-style outdoor garden at the Alive Museum. The first thing you see upon arrival at the carpark is the building’s majestic exterior. There are lots of parking available – go early as the Alive Museum can get quite crowded especially with the tour groups. 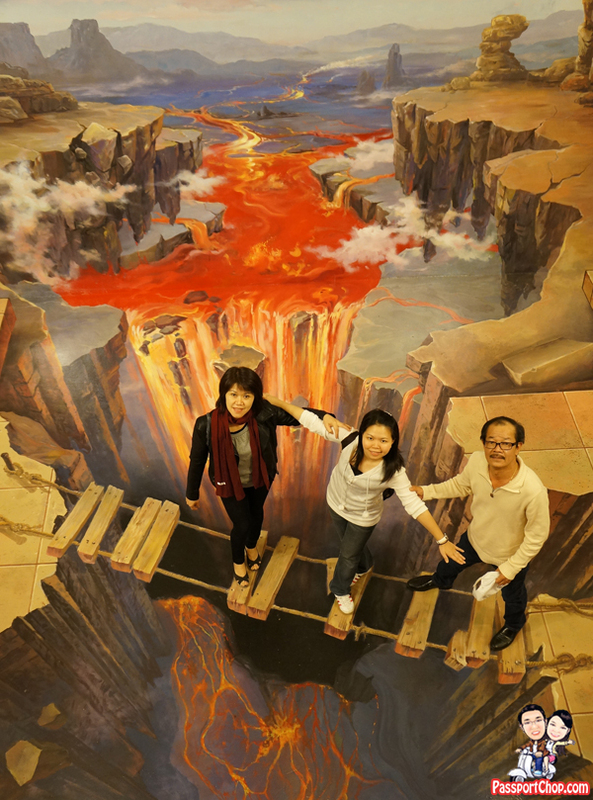 Expect to spend at least 2 hours in the Jeju Alive Museum at Jungmun Resort (or more if you pose with every optical illusion art form – and trust me, you will be tempted to do so once you see these awesome trick art exhibits!). 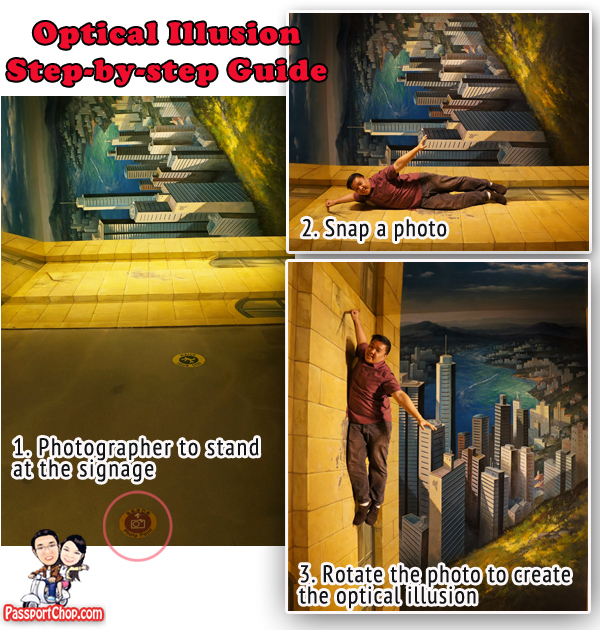 Don’t get too excited to pose with the optical illusion trick art forms and miss out the Alive Museum’s suggestions on how to pose and the angle to take the picture to create a realistic optical illusion. There are usually written guides (in English) by the side of each exhibit or some of the larger productions of trick eye optical illusions (like the pictures you will see below), the spot to take a good picture is usually clearly marked (see picture below). … crossing a rickety bridge across hot lava! These pictures are a very small proportion of the many exciting exhibits at Alive Museum at Jungmun Resort (Jeju) – so go experience it for yourself! The last section of Alive Museum (before arriving at a souvenir shop and cafe) is titled Provence Art. 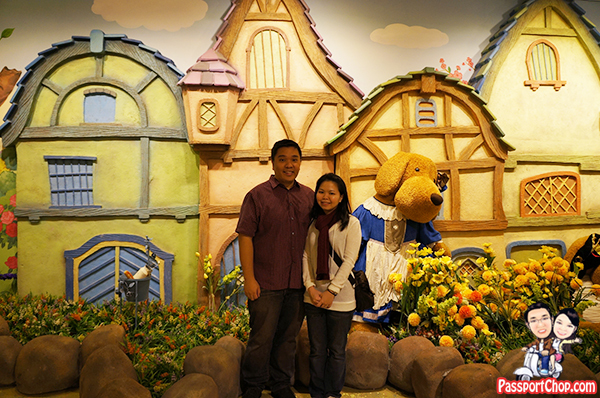 Here you will find teddy bars dressed in period costumes with a pastel colored fairy tale village as the backdrop (it is a small room when compared to the other exhibits at Alive Museum – not optical illusion trick art effects just cute sweet exhibits of big teddy bears and other animals. Getting to Alive Museum by Public Transport: From the Jeju airport, take Bus 600 to Yeomiji Botanical Garden Entrance. From there, walk north for approximately 12 minutes in the direction of the Jeju Tourism Organization Welcome Center.